In this article, I briefly described what MLflow is and how it works. 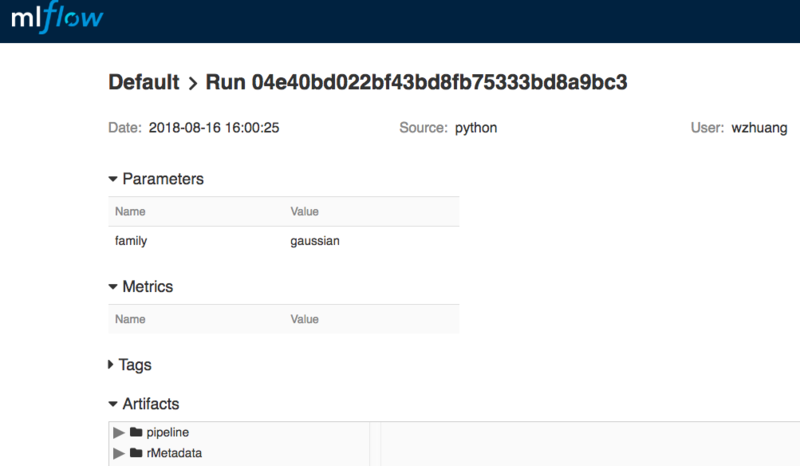 MLflow currently provides APIs in Python that you can invoke in your machine learning source code to log parameters, metrics, and artifacts to be tracked by the MLflow tracking server. The last approach is simple and easy, while allowing you to interact with MLflow without waiting for R APIs to be available. In this tutorial, I explain how to do this with the reticulate R package. reticulate is an open source R package that lets you call Python from R by embedding a Python session within the R session. The package provides seamless and high-performance interoperability between R and Python. The package is available in the CRAN repository. MLflow also comes with a Projects component that packs data, source code with commands, parameters, and the execution environment setup together as a self-contained specification. After an MLproject is defined, you can run it everywhere. Currently, MLproject can run Python code or a shell command. It can also set up the Python environment for the project specified in the conda.yaml file defined by users. For R users, it’s common to load some packages in the R source codes. These packages must be installed for the R code to run. In the future, it could be a good enhancement for MLflow to add something similar to conda.yaml to set up R package dependencies. This tutorial explains how to create an MLproject containing R source code and run it with the mlflow run command. In this tutorial, you will install and set up the MLflow environment, train and track machine learning models in R, package source codes and data in an MLproject, and run it with the mlflow run command. Before beginning this tutorial, Python should be installed on the platform where R is running. I prefer installing miniconda. Because the machine learning training will be done in R, R should be already installed on the platform as well. Completing this tutorial should take approximately 30 minutes. Install the reticulate package through R.
reticulate allows R to call Python functions seamlessly. The Python package is loaded by the import statement. Calling to a function is through the $ operator. As you can see, it’s simple to call Python functions in the os.path module from R with this package. You can do the same thing with the mlflow package by importing it and then calling mlflow$log_param and mlflow$log_metric to log parameters and metrics for the R script. The following R script builds a linear regression model with SparkR. You must have the SparkR package installed for this example. You can either copy the script to R or Rstudio and run it interactively, or save it to a file and run it with the Rscript command. Make sure that the PATH environment variable includes the path to the mlflow Python virtualenv. Launch the MLflow UI by running the mlflow ui command from a shell. Then, open a browser and go to the page link using the URL http://127.0.0.1:5000. Your previous GLM model training is now showing and can be tracked. The following image shows a snapshot of this. Download to your platform the wine-quality.csv data to be learned. The R code includes three parts: the model training, the artifacts logging through MLflow, and the R package dependencies installation. In the previous example, the reticulate and rpart R packages are required for the code to run. To pack these codes into a self-contained project, some sort of script should be run to automatically install the packages if the platform does not have them installed. Now, let’s write the spec and pack this project into an MLproject that MLflow knows to run. All you need to do is create the MLproject file in the same directory. This file defines an r_example project with a main entry point. The entry point specifies the command and parameters to be executed by the mlflow run. For this project, Rscript is the shell command to invoke the R source code. The r-repo parameter provides the URL string where the dependent packages can be installed from. A default value is set. This parameter is passed to the command running the R source code. Now that you have all the files required to train this tree model, you can create an MLproject by creating a directory and copying the data and R source codes to that directory. The previous MLproject can be checked in and pushed to the GitHub repository. Use the following command to test the project. It can be run on any platform that has R installed. 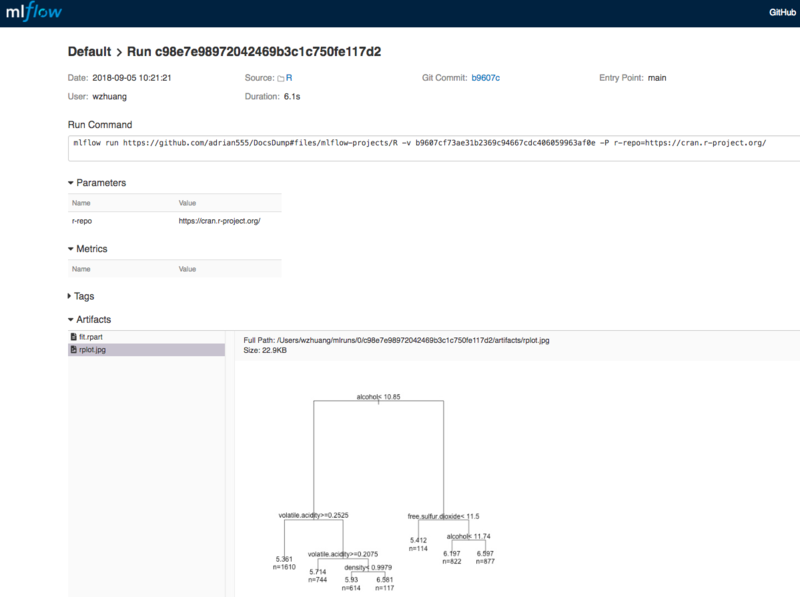 The differences between this view and the previous run without the Mlproject spec are the Run Command that captures the exact command to run the project and the Parameters, which automatically logs any parameters passed to entry points. In this tutorial, you have successfully created an MLproject in R and tracked and ran it with MLflow. This approach lets R users take advantage of the MLflow Tracking component so that you can track your R models quickly. It also demonstrated what the Projects component of MLflow is designed for – to define the project and make it easily to be rerun. R users can quickly set up their projects and enjoy the ease of tracking and running projects with MLflow.